Evening Tea Time Snacks collection. For most people tea gets least priority at tea-time! Tea-time is more of a ritual, which helps one to unwind in the middle or end of a busy day. It is a time to just relax and contemplate by yourself or spend in the company of your loved ones. Of course, hot beverages and scrumptious snacks do fit beautifully into the scene! A cup of hot coffee, Tea or cocoa, or a glass of cold Chaas or Lemonade in the hot summer days, is often a must-have during tea-time. But more exciting than this are the snacks that are served with the Beverage. Sandwiches and Biscuits, Cookies and Puffs, Pakoras and Puris – there is no end to the choice of tea-time snacks that we can pick from. Depending on the season and depending on other circumstances, the snack might be deep-fried or baked, light or heavy, quick or elaborate, readymade or homemade, fresh or from the jar. And so does the choice of snacks enjoyed with the beverage. On a weekend you might want to make something elaborate while on a weekday, you will just want to pull something out of the jars! So, in the weekend when you find time, stock up the jar snacks so that tea-time will become easier on weekdays. Some people prefer to have a heavy tea in the evening with something elaborate like puri or chaat, so that they can just finish with a light dinner at night. Others prefer to keep tea light and have dinner properly. So, it is all about personal preferences. Fluffy, spicy Masala Puri or Spicy Urad Dal Puris are some lip-smacking delights. Also, Khakhra Chaat and Hare Chane Ki Chaat are some quick and easy recipes that you can make for tea time snacks. Tea-time snacks usually happens sometime between 2 p.m. and 6 p.m. Each one has their own preference. Some families get together at tea-time, so they prefer to have it a little late so that everybody will be back home from school and work. Others like to have their Tea with friends at office, so maybe sometime around 3 or 4 p.m. will work right for them. So, depending on the circumstances the time might differ. While you are at work , you can carry dry snacks like Whole Wheat Flour Chakli, Flax Seed Shakarpara, Masala Mathri and Suhaali and munch with your cup of tea/coffee. Tea-time is so enjoyable that people also use it to celebrate a special occasion or achievement. A high-tea party is basically one that is held in the early evenings, where hot beverages and a couple of interesting snacks are served. The focus is on the snacks and the interesting conversations that happen between friends and family! A high-tea is good fun, and easier to host than a lunch or dinner party. Deep-fried Cabbage Vadas, Kand Aloo Pakoda, Green Peas, Potato and Paneer Cutlet or Batata Vada can be relished with tongue-tickling chutneys like phudina chutney, imli chutney or a wide range of dips/sauces. 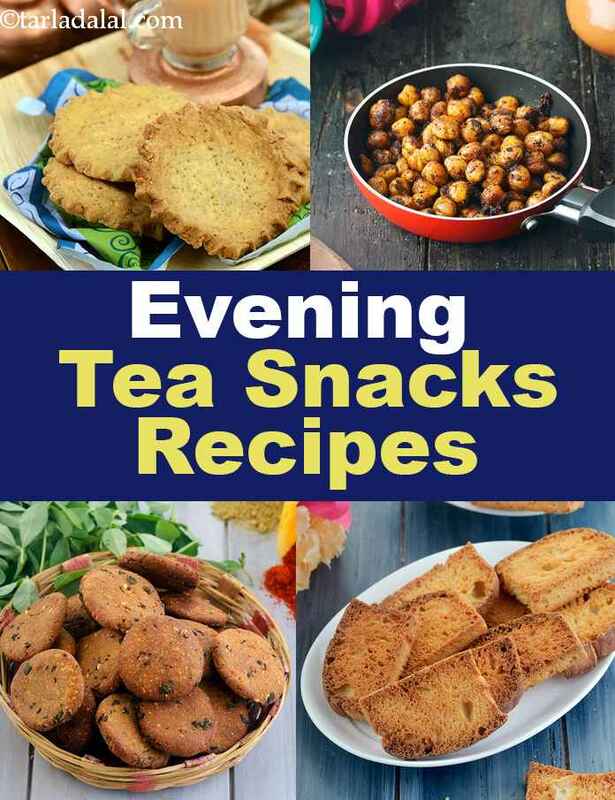 Enjoy our collection of 1190 Evening Tea Snacks and other artilces below.